When I was a student, I was the true definition of a rote learner. I also was very involved in extra-curricular activities, so I would do what I needed to in order to obtain the grade I wanted. Now as a teacher, I regret that the school system allowed me to spend so much time focusing on grades, instead of truly learning. I feel that a significant part of this was the assessment process. If I got a poor score on a test, I didn't always go back to learn what I missed. If it was going to be included on another assessment (ie: final exam), I would learn enough to get by, but never go back to fully understand the content and how it related to the course or real life. As a teacher I am now trying to change how I assess (both formatively and summatively) to create learning experiences from these assessments. I had been finding that students who receive an "A" feel that they have learned all that they need to learn, and student who receive an "F" feel that they cannot learn. Therefore, I am working to promote continuous growth through assessments, instead of an assessment being the "final call" of what a student knows. Last year, I started incorporating students in the assessment process. 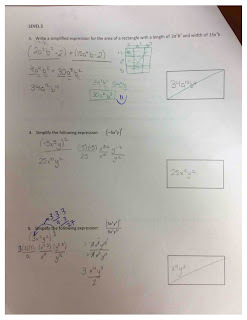 For the first quiz of the year, I have students grade their own assessment. I do this by passing back each student's quiz with a colored pen. 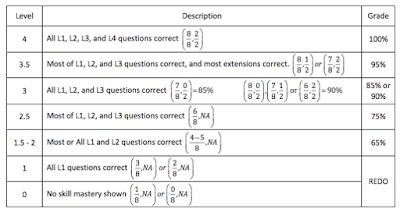 I show the answer key over Apple TV and talk through how I grade each problem. 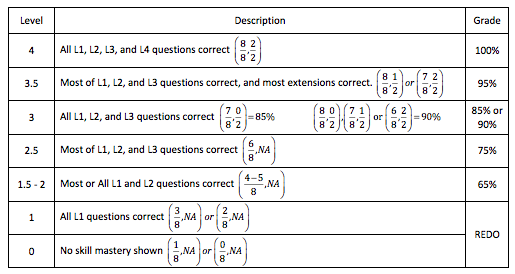 Finally, I show how I use the grading rubric to assign a grade to the quiz. 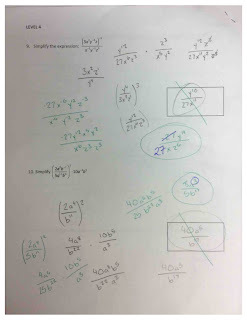 Once they have assigned their grade, I have them go through the questions that they got wrong and make corrections. As you can see, students are using this assessment as a learning tool, fostering more growth and understanding. These quiz grades go in the gradebook in the formative category, so there isn't a battle over getting "points" back. The conversations with students were focused on the content and application of skills instead of spending time discussing grades. It was awesome! As I continue to grow in my professional development, I am becoming less scared of trying new things. Throughout the year, I hope to keep the assessment conversation going, as well as continuously obtain student input as to assessment methods that continue to motivate them in the learning process. I will continue to think back on the thought of "What would have made me want to learn in class?" instead of my high school mentality of "What do I need to do in order to get the grade that I want?" I will be following up with more posts on student involvement in the assessment process, so stay tuned!